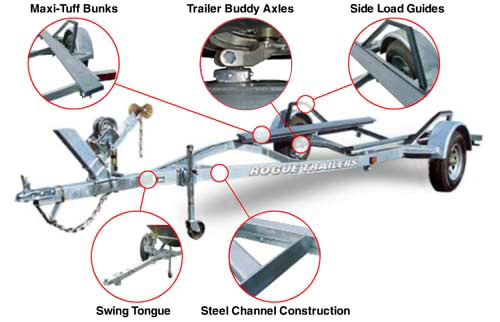 Rogue Trailers are all welded galvanized steel channel contstruction, which resists rust and corrosion. They are ultra-strong, easy to maintain and make loading and launching a breeze. Premium components like Trailer Buddy™ bearing protectors, Maxi-Tuff™ bunks, Trailer Buddy™ axles and UHMW side load guides make Rogue Trailers the best ride available for your new Alumaweld boat. Rogue Trailers are drive-on bunk trailers that properly support the bottom of your boat and are built for the long haul. LED tail lights & marker lights - waterproof and bright, they come standard. LED lights are low maintenance and last longer than conventional lights. Maxi-Tuff™ Bunks - no wood to rot or carpet to replace. The Maxi-Tuff™ bunks are naturally slick and take the work out of launching and loading. Galvanized steel - the super-strong channel construction is easy to service and easy to rinse after saltwater immersion. Steel channels add years of life. Trailer Buddy™ axles - these unique axles tow beautifully and act like independent suspension while eliminating "leaf spring" failure. Side load guides - precisely angled and covered with a high density plastic, Rogue side guides make loading extremely safe and easy.